As timber is a natural product, we will choose the best boards to suit the specifications you desire and that has been sent to you on your invoice. We will not replace or refund an item if the colour, degree of feature in the timber or final sizing does not meet your expectations. As timber is a natural product any cracks, fissures made due to a change in the environment overtime will not be deemed as Major defects and will therefore not be covered on warranty. Standard dining table heights are anywhere between 72cm and 76cm. Once a deposit is paid, J R Bespoke designs will strive to complete your order between 6-10 weeks. This may increase or decrease throughout the year, so please feel free to contact us for a better idea. Local delivery around Melbourne is handled by our drivers and we will keep in contact with you throughout the order to organise the best date to deliver. For deliveries in outer Victoria and other States, we use a reputable transport company and an experienced furniture delivery team in your area to bring your piece and install it in your home. We believe that your piece should be treated with the utmost care. When your order is despatched, we will contact you by email and/or SMS with the relevant tracking information so you can keep a close eye on your delivery. 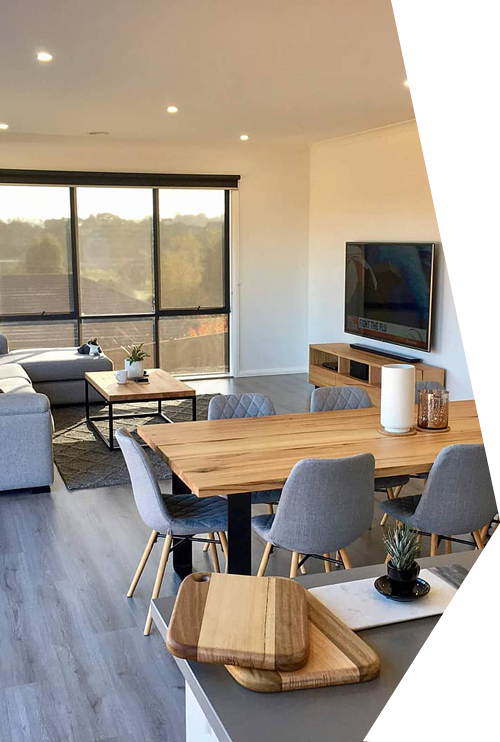 For orders being delivered within Melbourne Metro consisting of bulky or fragile items, you will also receive a call from one of our professional furniture delivery team to confirm a suitable time for delivery. Once delivered, you will be asked to sign a goods delivered in good condition agreement. Please make sure you fully inspect your table and confirm that it is in good condition before you sign. Our warranty covers the structural integrity of the timber items and is limited to the repair or replacement of the item. Timber is a natural product, and as such is subject to the effects of the environment. Changes in humidity or temperature levels can cause small cracks to appear. Any splits, movements, joint separation or cracks created as a result of sudden changes in the environment are not warranted. We offer wide range of Custom Made Furniture, Dining Room Furniture, Custom Made Tables, designer Entertainment Units & Modern TV Cabinets. We deliver custom furniture in Kew, Ivanhoe, Hawthorn, Balwyn, Eltham, Melbourne, Sydney, Brisbane, Gold Coast, Adelaide & surrounding area.